So, I’m still busy with several projects that have an end of month deadline. Not wanting to put much exploration or energy into this page, because I need both for my other projects. I hesitated to go with negative painting because I’ve been doing that so much lately. But, then, I was passing by the pears in the grocery store, and I suddenly thought–why not work with a nostalgia based specifically around negative painting! 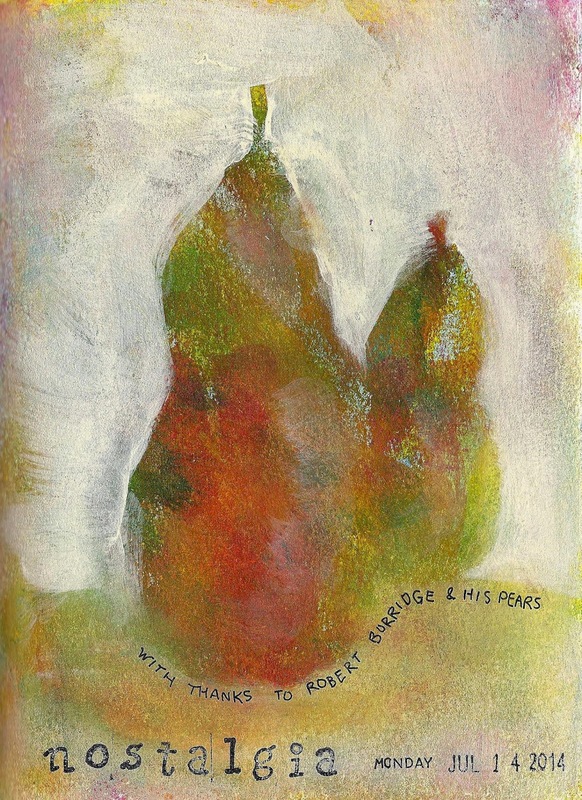 Years ago, I saw this video of Robert Burridge painting pears. This was before I had ever heard of negative (aka reductive) painting, and his 1 minute video wowed me. It comes to mind every time I see pears, and I still think ‘wow’ whenever I watch it. It makes me feel nostalgic to think about it, because that one minute had a great impact on my work going forward. Because the technique is so simple, but so effective. Literally, you can do a painting like this in minutes. I’m not even going to write up my process, because if you watch the video, you’ll see it. I will tell that I used Raw Sienna, Hansa Yellow Medium, Quinacridone Magenta and Manganese Blue Hue acrylic paints for my background, squirting the paint directly on the paper and then using a paper towel to spread them out. I used Titanium Buff to carve out my pears. Thank you! I love that video. It's something I come back to again and again when I feel the need for inspiration!